House prices in the UK could fall in 2019 if the government fails to reach a Brexit deal, one senior economist has said. Howard Archer, chief economic adviser to the EY ITEM Club, said he expected prices to fall "modestly" if there is no agreement with Brussels. However, a negotiated deal could see prices rise by around 2%, he said. It comes as the UK's largest mortgage lender, the Halifax, said prices rose by just 1.5% in the year to October. That is the lowest annual rise since March 2013. 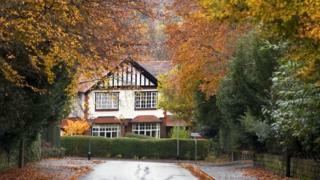 Prices rose by 0.7% between September and October, following two successive months of price falls. The Halifax believes house prices will continue rising, by as much as 3%, over the coming months, pointing out that the supply of properties is still limited. "Further house price support comes from an already high and improving employment rate and historically low mortgage rates which are creating higher rates of relative affordability," said Russell Galley, managing director of the Halifax. The average UK house price is now £227,869, the Halifax said.